Got a couple of craft/sewing books lately. The above book by Tone Finnanger is my fourth by this talented designer. It is the thickest yet. Jam packed full of patterns! Yeah! My favourites in the book are the animal softies. I will take a pic of my "projects to do" from this book as soon as camera battery charges and I have no work commitments. I am in a softies phase lately but I also go through bag making phases and kitchen accessories phases too. I can feel a hat making phase just around the corner so watch out for my creations of caps and cloches. This hat phase was triggered during the heat wave and I had to purchase fish and chips for tea as it was too hot to cook. While at the servo waiting for our tea, I saw a stand full of caps. Many were made from linen type fabrics and houndstooth and tweeds. I have had an itch to make one ever since. Must go Hubby has started defrosting tea and he never does that! So! Must be he is subtly telling me I am a slacker. No name softie from the book Softies is meant to be a giraffe. That's what the designer calls her design, but my friends call my creation an alien. My skinny little alien. 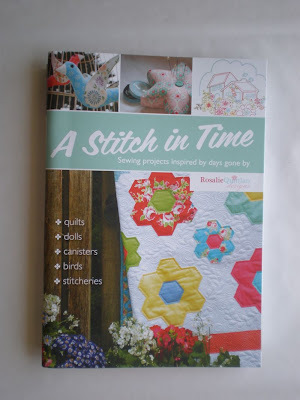 A fun project to do and one of the first projects started and finished from the book. 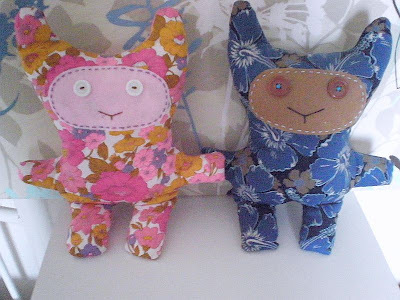 I have been reading the Two little Banshees blog for years and fell in love with all her great softies. A pattern for one of her creations in the book "Softies" was THE reason I purchased it. 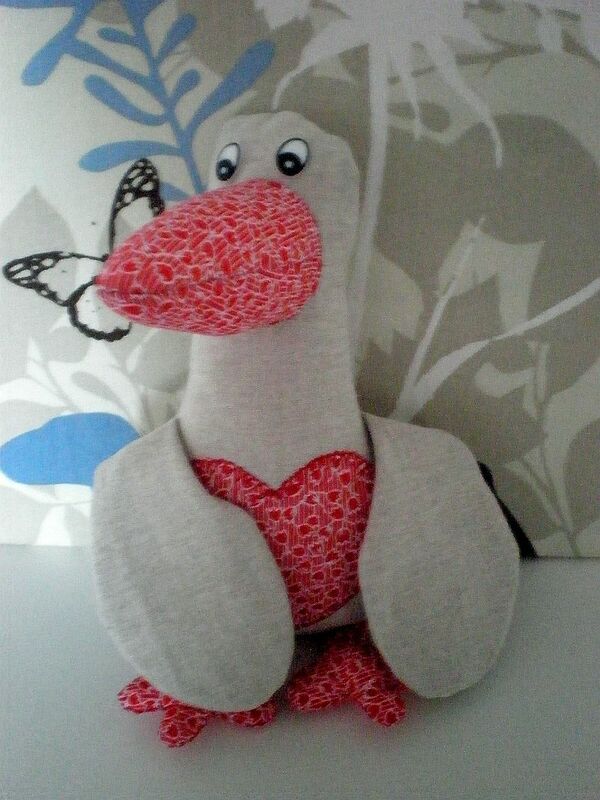 I also have made her platypus design published in a Handmade Magazine. Pics soon. I know the pics are not great and I should get a kick thumbs down award for them but my camera is not being my friend at the moment. One of my first softies made ever! I just scribbled a shape on newspaper and cut them out, did the face and some sewing/stuffing and voila! Inspiration came from some blogs read 2006/2007? and the only blog I can remember the most was called Moopy and Me. 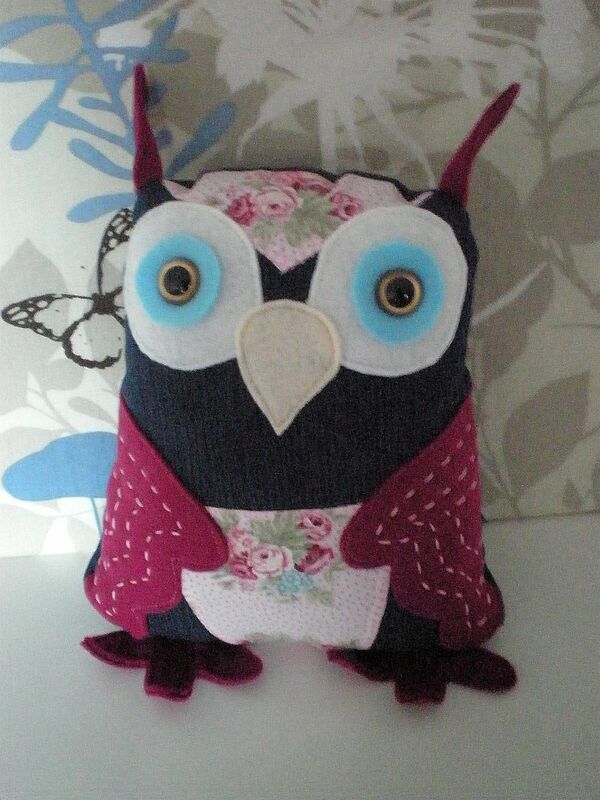 I have been busy with sewing lately, but just haven't quite finished enough to take photo's. The witches costume was finished and waiting for my niece to turn up and try it on. I was going to take a pic of it then to show, but she arrived at my home while I was at work and rang me at work to say thanks and took off with it. I have also nearly finished Xmas stocking for a work colleague. Will not say much more about it as I will do that when I can take a photo. I will say however that it is a Tone Finnager pattern. This is Ducky. I love Ducky and he still lives with me. I learn't a new skill during the making. It was in constructing his beak. At the start it looked difficult and maybe too involved for a lazy girl like me but I wanted the softie badly so I had to make it. And let me tell you! The processes involved in this ducks construction were extremely easy. Yes even the beak. 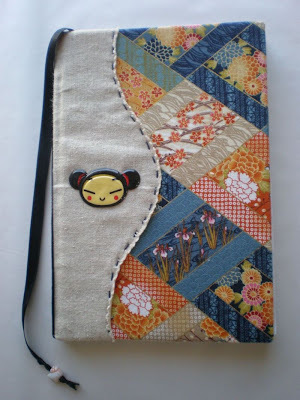 If you would like to have a go at making one yourself, visit "The Long Thread" here. It's hard to judge the size of this owl from this picture, and since I don't have him anymore, I will guess he was/is about 30 - 40cm in height. I gave him to my grandma on her 81st birthday. 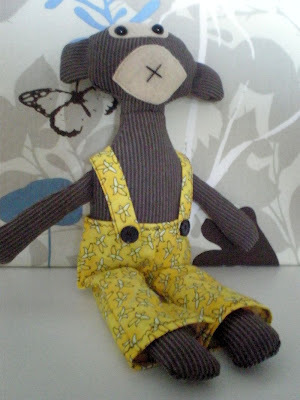 I made him using up some scrap fabrics and recycled fabric from old jeans. I love his golden eyes the most and the fact that I can't find any one thing that I would alter. You all know that we sewers are our own worst critics and find faults with what we make that nobody else would even notice. This owl is one of the few exceptions. I have no itch to undo and redo any part of him. It leaves you feeling completely satisfied and on a sewers high for a day or so. 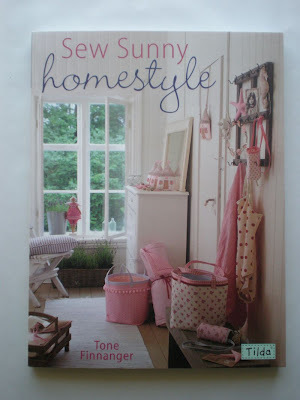 For those who want to know about the designer and pattern I will go now and dig out the magazine. I do know that the pattern came from a Australian sewing magazine, "Handmade". I found it! I am not surprised to find the designer is "Jhoanna Aranez" of One Red Robin fame. The issue of Handmade magazine is Vol 25 No3. That's it for today as I want to show you my current projects and must finish them first. We are still having the unexpected heatwave here. It has sapped all of my energy and I am coping by turning the stereo up really loud to drown out the heat. It works, believe me it really does. Cold drinks help too!! Don't worry about the neighbours. We live in area of 5 acre allotments so lots of distance between us. This is Stanley. Gone to a good home now but still fondly remembered. He is from the book "Softies" and designed by one of my favourite designers Fiona Dalton of "Hop Skip Jump". I am a newbie to softie making and I think Stanley turned out ok. He was easy to make or the instructions in the book are really well written. Emo Girl. She was a great scrap using project. 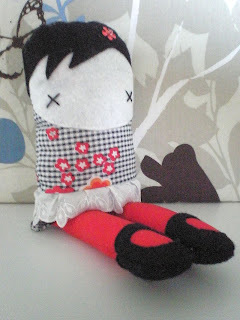 I cannot remember where I found this doll on the internet, so if anyone has an idea, could they let me know and I can give credit where its due. 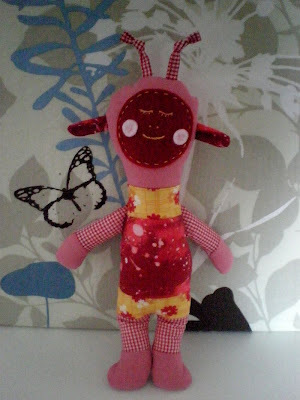 I saw this doll on someones blog and wanted one of my own. I couldn't get a copy of the pattern so I finished up making my own pattern. She turned out alright and exactly how I wanted her to. She has also left me to go live elsewhere. My little niece is looking after her. Must go. My boss just rang and wants to add some stress to my life (only joking) The security guys at work want to do something to our electronic keys. Wipe the data clean or something like that. I hope mine works when I go in this weekend! is hot, hot, HOT, and we are told to expect another three days of it. DH tells me that it will be a record heat wave for November. Well that helps me cope......not!! Too hot to do housework. So I have been trying to sew. Yes I said TRYING as its even too hot to sew anything new. I have been pottering around doing little bits to some UFO's. Very little bits that don't make much difference to the pile of UFO's but they are getting closer to being finished. I have some pics of completed projects from before I started blogging and will post about them until this heat wave is over. 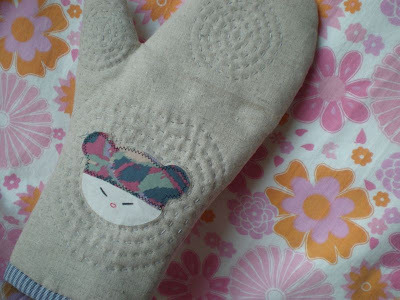 This oven mitt was fun to make. I don't know if anyone else gets the urge to make something with what I call "yucky" fabric. Just to get rid of it. As I can't just throw away fabric even "yucky" stuff. And does anyone else find that the project ends up fun to do and the finished article looks unbelievably good? This oven mitt was such a project. The lining was not inspiring me or the scraps I used for the applique, but made into a linen mitt the fabrics all work right. Pattern was from Lotta Jansdotter's "Simple Sewing" book, but I just followed my own plan in making it up. It would have been an exceptionally quick project except I decided to hand quilt both sides of gloves and hand quilt the lining (in front of telly so no hard task). 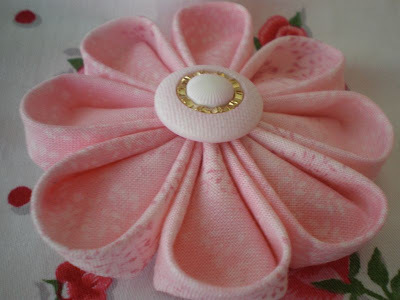 I have been learning to make these Kanzashi flowers. This is my second one. The petals are made from 2 1/2 " fabric squares. I will need to practice at this size for a while before I attempt the little ones.